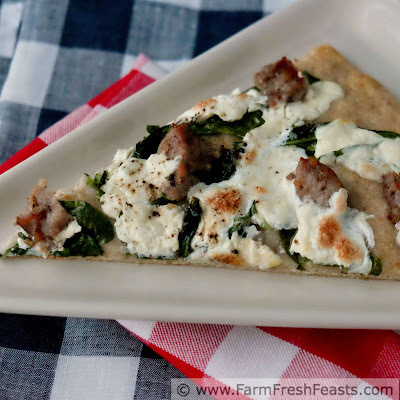 A fast and easy white pizza with fresh creamy burrata cheese, peppery arugula, and Italian sausage. This colorful pizza is a tasty way to involve cool weather greens in a family style pizza. When your Community Supported Agriculture (CSA) farm share box is heavy on the greens, which happens at the beginning and end of the typical temperate season, it can be overwhelming. I wrote about my Greens Paralysis here, in a recipe for Slow Cooker Spicy Mustard Greens Soup. Rest assured, new seasonal eaters, even though I've been eating from the farm share for 11 years now, I still get stuck. There are myriad ways to eat greens. Having an idea of how to use each type of green (raw or cooked) helps a lot and is part of the reason I started this website. Arugula is such a versatile green. This Fall we've been enjoying it as the basis for hearty main dish salads, tossed with a red wine vinaigrette and topped with boiled eggs, beans, peas, goat cheese, dried fruits and nuts. I've tossed arugula into pasta dishes for color, nutrition, and to get it out of the crisper while it's still fresh. I've processed and frozen arugula as arugula pesto when I didn't think we'd have time to eat it fresh. A leafy green that's yummy both raw and cooked is useful indeed. Regular readers know that I am often working up to a year ahead. Since I'm a seasonal eater, by the time I get the photos out of the camera and the scribbled recipe notes onto a screen we're onto a new season. In fact, the Thanksgiving recipes I'm sharing now were created (and photographed and enjoyed--hot!) last year. 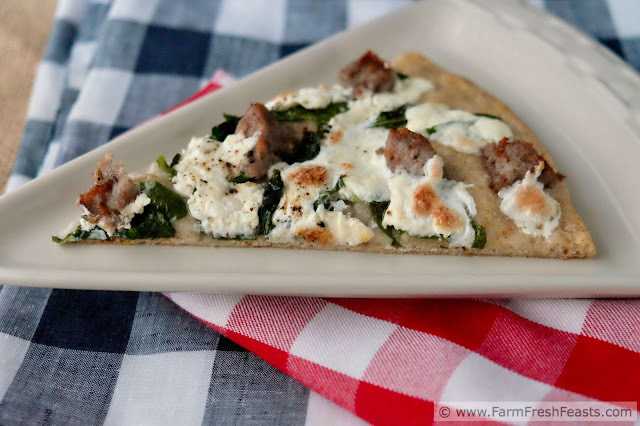 I enjoy sharing ways to use the farm share here, but my family likes to eat food while it's hot, and I like to kick back and enjoy our Friday Night Pizza & Movie nights with them. So what I'm fixing for dinner tonight may appear on Instagram, but won't be on the website for a while. If your family is not quite adventurous (or you don't have a bucket of red wine vinaigrette to use up like I have) consider using your arugula on this pizza. 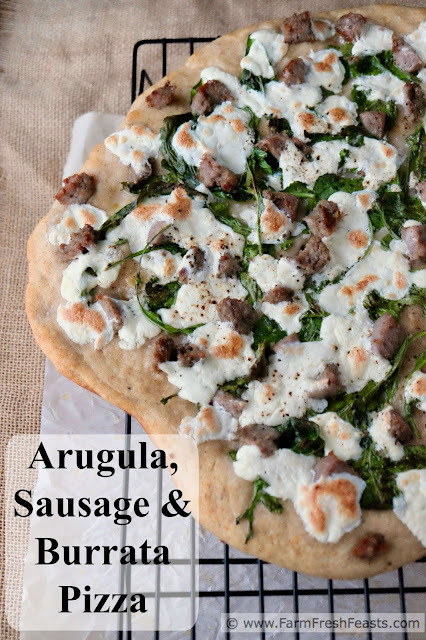 The creamy burrata cheese complements the peppery bite of arugula, and the sausage pulls it all together in a way that my family enjoyed. I tossed the arugula with a splash of olive oil prior to assembling the pizza, so the final taste is reminiscent of kale chips in that 'hot salty fat' flavor profile. Probably not the best description for a kale chip, but that's what it tastes like to me. In a good way. This pizza is better. For more pizza recipes, please check out the Visual Pizza Recipe Index. It's broken down into categories for pizza dough, vegetarian pizzas, savory pizzas using fruit, and of course meat-laden pizzas. I don't make new pizza posts just to have them get lost in the shuffle! For more recipes using arugula, please see my Arugula Recipes Collection. It's part of the Visual Recipe Index by Ingredient, a resource for folks like me eating from the farm share, the farmer's market, the garden, the neighbor's garden, and great deals on ugly produce at the grocery store. Preheat oven to 450 degrees Fahrenheit. If you've got a pizza stone, which I really recommend, leave it in the oven as often as possible and let it preheat as well. On an oiled piece of parchment paper, stretch out your dough into the shape it feels like assuming today. Brush the crust with about 1 to 2 Tablespoons of olive oil. Set aside. This allows the dough to rise a bit and makes for a puffier pizza than is shown above. In a medium bowl toss 2 Tablespoons of olive oil with arugula. Scatter across the pizza. Tear open a ball of burrata and drop ripped bits of cheese across the arugula evenly. Top with sausage. Sprinkle a pinch of salt across the perimeter of the pizza, and add freshly ground pepper over the center of the toppings. Transfer the parchment paper and pizza into the preheated oven. If you don't have a stone, bake on a cookie sheet. Bake for 5 to 8 minutes. 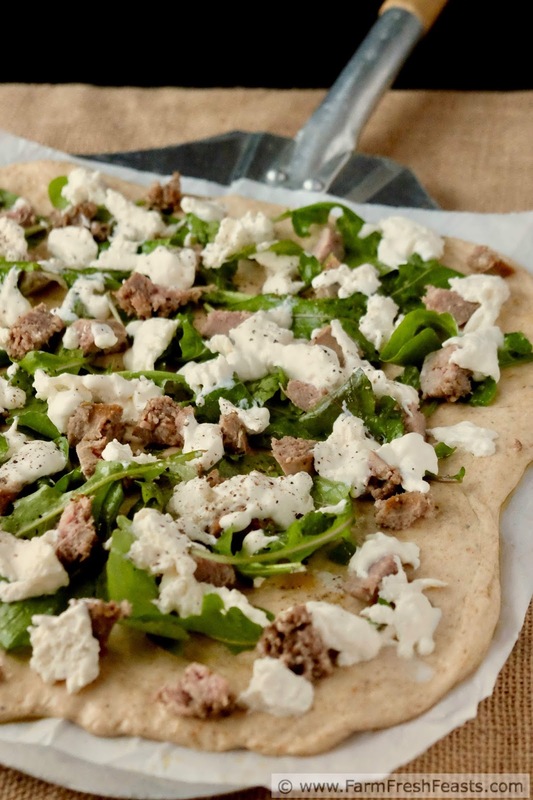 Shimmy the parchment paper out from under the pizza, and continue baking directly on the stone or cookie sheet for another 3 to 5 minutes, until the burrata cheese is lightly browned in spots and the arugula is crisped up where it peeps out from under the blanket of cheese. Cool the pizza briefly on a rack, and then slice and serve.